There was rain in our gauge on 8 days in August, totalling 92mm. Tanks are overflowing and the moisture seems to have pleased the recently transplanted tree fern. Still not sure if it will survive the trauma of the transplant, but here you see the unravelling frond arms, which were completely balled-up fists at the time of the move a few weeks ago. Lets hope they continue to unfurl and produce those fantastic fronds. ~ by Garry on September 1, 2011. Sounds silly, but I hate seeing my tanks overflow. Makes me wish I had more tanks to pick up the slack! 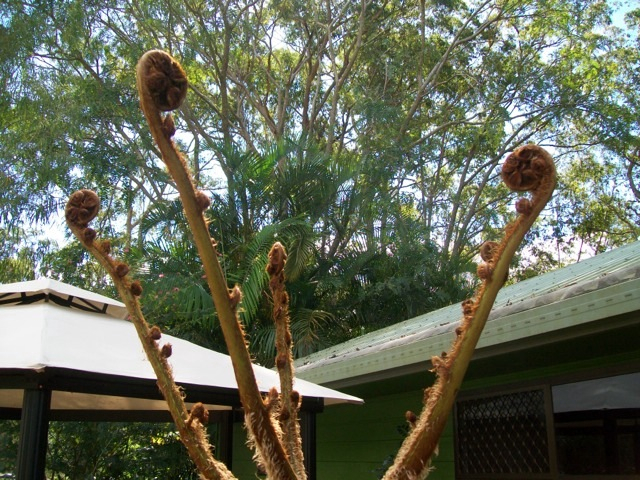 You’re probably already aware of this, but if the weather dries off, it’s a good idea to water the crown of the tree fern, rather than the soil. The “trunk” is essentially the plant’s root system. Keep this moist and the plant should settle into its new position without a hitch. Doesn’t sound silly at all, in fact it irks me too, so I have a plan for another overflow tank, maybe 40000 l + hooked up to a fire hose pump. There’d be no point trying to defend the place in a fair dinkum bushfire, but there just might be a need to douse something down some day. Thanks for the tip about the tree fern. Tamara and I have been disputing the species and whether or not our method of transplant will kill it. I think it is cyathea australis, she thinks it is a dicksonia antarctica. I really hope we haven’t killed it because it is gorgeous, but so far so good. I didn’t know about the watering of the crown. Will do. Hmm, now I’m wondering…maybe cyathea cooperi?